Explore underwater worlds at the aquarium. Stand on the visitors bridge and watch as the sea Lion jumps through the hoop and balances a ball on his nose. The nearby chart includes a clock with movable hands that makes it easy to see when the next feeding time is. Stick around for the next feeding or move over to the rotating carousel to observe other small sea creatures. If you stand inside the underwater viewing area, it feels like you’re a part of the ocean as the fish swim by you! 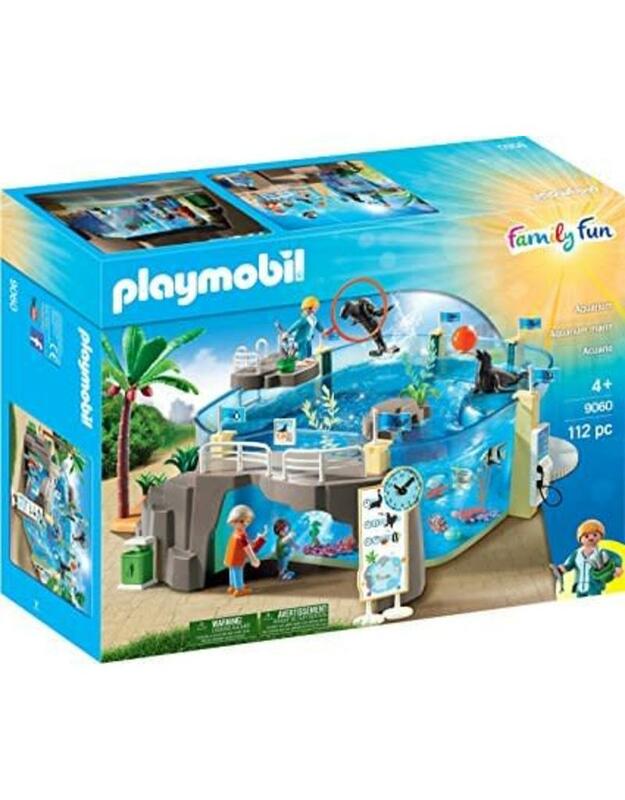 fill the aquarium tank with water to experience the most realistic playtime fun. Set includes three figures, three seals, colorful fish and sea creatures, bucket with fish, coral, recycle bins, feeding time clock, and other accessories. Dimensions: 15.7 x 16.9 x 6.3 in (L x W x H). recommended for ages four and up.